«Astana» in the away match beat the Russian «Avtodor» — 88:64 (19:14, 14:20, 31:14, 24:16). «Avtodor» (6-8) and '»Astana» (8-6) are actively involved in the fight for the playoff and come to an important fight, both being in the Top-8. The first half showed an equal fight. At the beginning of the second quarter, the club from Kazakhstan, thanks to the active actions of Kenneth Horton and successful defense, achieved a double-digit gap in the score (27:17). It took only a minute for 'Saratov' to return, during which Perrin Buford scored 7 points in a row (24:27). Closer to the big break, thanks to the precise shots of Trae Golden and David Kravish, the Volzhans even took the lead (34:33). «Astana» immediately after the side-switching organized a 7-0 spurt (5 points in Horton’s account). Avtodor responded with hits from Kravish and Boris Savovic, but the guests have already gained momentum in the game. The champion of Kazakhstan in the first half realized only 3 out of 15 shots behind the arc. In the third quarter, the team had a breakthrough. Long shots of JJ O’Brien and Rustam Yergali not only brought Astana a solid advantage (20: 4, 53:38) but also had a demoralizing effect on their rival. 'Saratov' began to turn the ball over and switched to the individual game. After three quarters, Kazakhstanis led with a score of 64:48 and in the final segment confidently brought the game to victory. 'Astana' beat 'Avtodor' (100: 83 in Kazakhstan) for the second time this season, spoiling the mood of Evgeniy Pashutin, who held the first match in the League after returning to the position of head coach of 'Saratov'. 'Avtodor': Perrin Buford (16 + 6 rebounds), Boris Savovic (16), David Kravish (10 + 12 rebounds). 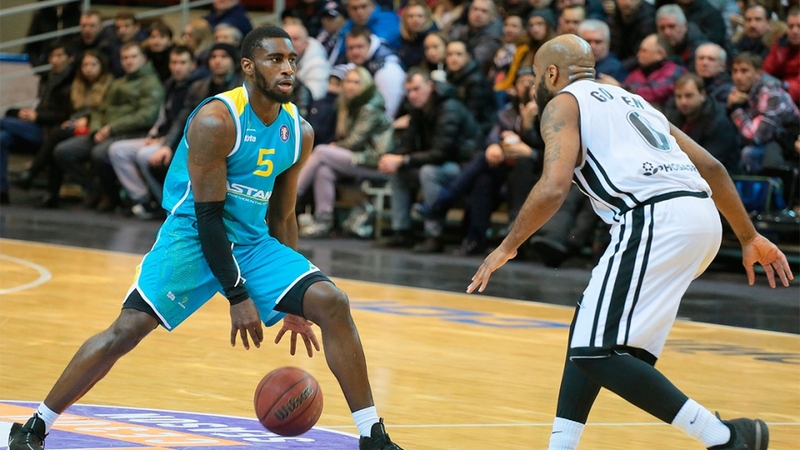 'Astana': Kenneth Horton (20 + 7 rebounds + 4 steals), Anthony Clemmons (18), Jeffrey Groscell (12 + 7 rebounds). Figure: “+19” — the advantage of “Astana” in points of a second chance (25: 6). Kazakhs controlled the rebounds (45-32) and constantly took advantage from it. Hero: Kenneth Horton. The forward was useful on both sides of the court and helped 'Astana' confidently start the third quarter, which became the crucial one. Horton has 20 points, 7 rebounds, and 4 steals. «We were expecting a tough match. 'Astana' has a very good, organized team this season. We didn't have much time, but we were seriously preparing for the game. They knew that the rival had a lot of shooters on the perimeter, they could all attack with a high percentage. In addition, «Astana» is actively using its front line. We were planning to prevent their attack. In the first half we did it, we missed 33 points, and in the third quarter — as many as 31. This was the reason for the defeat. We came after a big break completely unprepared and started to make mistakes and lost 10 points at once. And if in the attack, with the arrival of a new coach, the guys could find it difficult to immediately reorganize, because we began to play other combinations, then in defense we had to continue to play as effectively as ever; and in the first 20 minutes, do not allow opponents to score light balls. When 'Astana' led with a double-digit advantage, they felt self-confident. We, on the contrary, began to make unprepared throws, the point-guards made a lot of losses, which resulted in easy points in our basket. In addition, we lost a rebound game, allowing the guests to take 16 rebounds in the attack and score 5 times more «second chance» points». «It was a really important match for us because the hosts are our closest neighbors in the standings and direct rivals in the fight for the playoffs. We were seriously preparing for this game and were expecting a very difficult match and that’s how it turned out to be. The final score does not reflect the real balance of power. When we succeeded in the third quarter, Avtodor players in a somewhat relaxed manner, so the difference began to grow. I am very pleased with my players, especially how they played in defense and how they acted, especially in the third quarter. Now it is important for us to take this very important victory as a basis for our self-reliance and continue to progress. The team will play the next matches on the road, on February 5 and 6, 'Astana' will be visiting Atyrau, where they will meet with the local 'Barsy Atyrau' basketball club within the framework of the regular championship of Kazakhstan among the men's teams of the National League. The next match of the VTB United League 'Astana' will play at home, on February 12, the capital basketball players will host the Polish basketball club 'Zielona Gora'.